A Portland painter finds her niche with customized paintings on the 1970s' favorite fuzzy fabric. 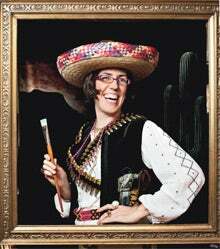 Entrepreneur: Jennifer Kenworth, aka Juanita, the velvet painter. "AHA" Moment: In 1999, when Kenworth did a ceramics residency at a pottery studio in Gerlach, Nev., a local had a very specific request: a painting of Elvis on the cross--on velvet. Though resources were scarce in the tiny desert town, Kenworth was up for the challenge. Working from an image of Elvis in a library book, she used acrylic paint and a box of velvet scraps to create a painting she sold for $50 and a bottle of tequila. What Possessed Her: After her residency, Kenworth moved back to Portland, Ore., and continued to paint Elvis on velvet. But she soon got bored with the King, and opted to paint other random ideas--beer cans, Star Trek characters, Mr. T. After years of showing in art shows and fairs, last year she got consistent requests for custom velvet paintings, so she made those her focus. Why? "Velvet paintings make people smile," Kenworth says. "They conjure up memories and stories." She began painting at age 5, but moved her focus to sculpture in art school and didn't paint for about 13 years--until the Elvis request. Kenworth discovered a renewed love for painting, and found velvet an intriguing medium to work with. Customers: Most of Kenworth's customers find her through art shows or her blog, velvetjuanita.blogspot.com. They e-mail their request, along with relevant photos or images, as well as specifications (e.g., "The monkey needs to wear a red beret"). And many give the paintings as gifts: Last year, most of Kenworth's commissions were for wedding portraits. Even celebs love Juanita. David Arquette once bought one of her velvets--an 11x14 of the A-Team van. Quirky Requests: A skeleton wearing a Dodgers cap; a portrait of three men (one with a cat on his head); a reimagined wedding photo with the maid of honor as a monster from Maurice Sendak's Where the Wild Things Are, Clint Eastwood as the best man and Colonel Sanders above in the clouds. Cost: $150 for an 8x10. Prices go up from there, depending on the size of the canvas, how many people or objects are in the painting and how detailed it is. All paintings come framed; Kenworth shops thrift stores to find them and paints them gold as a signature touch. Up Next: Continuing to give customers the warm fuzzies with velvet commissions, as well as expanding into customized velvet pillows and jackets.